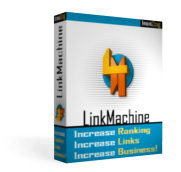 This section covers the additional tools that come with LinkMachine's Premium and SEO upgrade packages. Analyzes your site and your competitors to give you detailed steps for increasing your site's search ranking. Provides complete information about the incoming links to your site or to a competitor's site. Graphs the progress over time in your site's search ranks, PageRank, number of incoming links, and more. Easily manage LinkMachine on multiple sites.